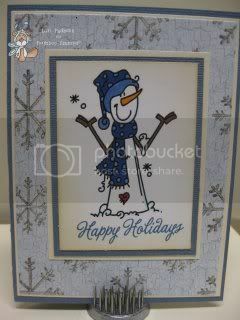 How cute is this Snowman from Bugaboo stamps? Adorable, right? He's called Snowman with Polka Scarf and you can find him at the store by clicking on his name. Head over to the Catch the Bug Blog to see what the rest of the Bugaboo DT wants to show you today on this Oldie But Goodie Thursday. You're sure to find some new favorites. I love all your snowman cards Lori =) well done!